Alligators are indicators that ensure trends based on the current period. The point is where the price will also move and how strong the movement is. The way it works is similar to crocodile, which is sleeping when you are full and waking up just to eat. What are the benefits of Alligator in trading? Alligator's main role is to ascertain what trend is controlling the market whether it is rising (buying) or down (selling), which means that the sign can be used for the trending period in the market. 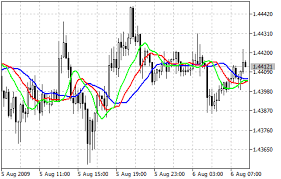 The steps to use it are easy, this tool represents a combination of the three Moving Averages that show various periods of time and movement. Keep in mind that the Moving Average is smooth and is not a simple or other type: it minimizes the impact of market noise and minor market fluctuations on the graph. 2. The time movement of the attached sign line indicates that the Alligator is sleeping. The longer he sleeps, the more hungry he becomes. This is a period of waiting if you catch this thing so it is not advisable to trade. 4. After eating enough, the Alligator begins to lose its appetite for "food" and the lines mark it back together. This shows the signal to end trading and wait for the next sign to return. That's how easy it is to read the alligator indicator, but it's just a simple strategy.